No.1 Strategy game in Windows Store Indie Game Collection! No.3 Strategy game in Windows Store Virtual Battle Collection! Top 5 Most Popular Strategy game in over 20 countries! 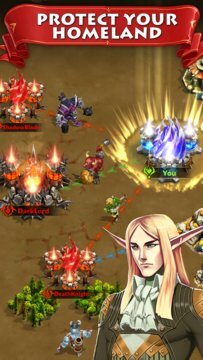 Storm of Wars brings real-time strategy combats to a kingdom building war game. It features fast-paced combat in cities and epic real-time wars on the world map that impact gameplay and strategy in fun, unexpected ways! Attention, warlords! Do you have what it takes to compete in the most epic MMORTS experience ever devised? Build an empire in a world of magic and conquest, develop your city into an invincible stronghold, summon legendary heroes to battle your enemies, wage war across a sprawling map, and test your mettle against millions of players worldwide! Choose your faction, dominate your rivals, and become the mightiest ruler the world has ever seen! ★ Fight real-time strategy combats both in the cities and on the stunning world map! ★ Choose from one of the four ancient factions, conquer the rivals in the vast world map to lead your faction to the ultimate victory! 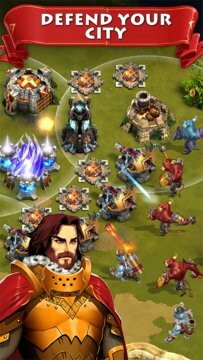 ★ Battle for control of the War Zone and precious resource lands to strengthen your empire and weaken the enemies! ★ Join other players to form a global guild, conquer and dominate rivals to become the most powerful ruler of the world! ★ Play, chat and socialize with players from around the world in a world of magic, mystery and adventure! ★ Compete in the leaderboard for power, honor, wealth and glory! NOTE! A network connection and Windows 8.1 / Windows Phone 8.1 or above are required to play. The game is free to download and play, however, some items can be purchased for real money. If you do not want to make in-app purchase, please disable this feature in your device settings. Also you must be at least 13 years of age to download or play Storm of Wars.